Minoushje took a small bottle from her pouch. "Here..." She said as she threw it towards Roy. "It's based on honey and thyme so it tastes pretty sweet." She completely forgot that Roy can read minds. Roy did a two finger salute, "Thankies..." She said, grinning. "Mino, follow Sasori-Sama please...I know he's fine...but I would feel better if someone was with him..."
She paused, looking at Zen. "...I actually do have some...me and Cooky were hiding in the shadows the entire time..." She said, smirking. "That must have been interesting. Think we could use those against him?" "I...don't remember where I put them...in my office some where. And it was hot dude. Not even gonna lie. Though, never telling either of them we saw." She said, snickering a bit. "So......do you want me to go see if I can find them or what? Pein would be quite interested to know about this, I think...."
Roy grinned, "Yeah, go find them...but I claim going with ya to see Pein-Chan's face that two of his members are gay..."
Zen grinned as well. "Sounds like a plan. I'll be back in a bit." With that, she rushed up to Roy's office and began searching for said pictures. Zen came in, waving the nefarious photos. She plopped down on the edge of Roy's bed. "When will you be well enough to go see Pein about this?" Roy shrugged, "Who knows. I just wanna get out of here..." She said, sighing a bit before coughing. "When do we wanna go there, hows that?" Paige instantly walked into the room and hugged Roy loosely but at the same time relieved. The worry and the fact that she'd been crying, was completely clear on her face. "Roy-sama, I'm so glad you're alright." "Hell, I'd be willing to go now if you were well enough." Zen's face was rebellious. 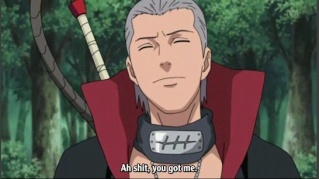 She wanted Hidan to pay for what he did- and this just might do the trick in that sneaky emotionally-scarring way. "Eh...Hiya Paige." She said, smiling. "All's good to go...and I think Mino will kill me if I try to leave right now." She said, snickering a bit. "It still hurts to breathe...but...I need to tell Sasuke what happened..." She said quietly. "....Do you want one of us to go?" The girl pulled back, releasing Roy and wiping at her eyes. "I'll meet him at the sammich stand and let him know. I know you probably want to tell him yourself but you need to stay here and right now I don't think anyone should come here unless they're an HMA member." Though Paige looked fragile at the moment because she'd lost a slight amount of control over he emotions, her voice towards Roy was serious. "I'll come as well, Paige." Roy looked at Paige, shaking her head, "He's coming here...I..." She paused, shaking her head. "I could've died...and I'm not waiting to tell him...he'll just get mad at me..." She said, gripping the sheets in her hand. Paige nodded. "I will Roy-sama. I promise you that on my life." The girl disappeared out the door and off to find Sasuke. "Why does she never wait for me?" Zen ran out to catch up with Paige. Roy sighed and leaned back, closing her eyes. "Geez...It still hurts to breathe..." She muttered to herself. "I wonder if Sasori-Sama and Mino are done..." Roy places a hand over her heart, gripping the cloth in front of it while narrowing her eyes. "This...was so scary..." She whispers to herself, clenching her eyes. Nikki, who had inconveniently fallen asleep under Roy's bed, crawled out and rubbed her eyes, "What the...what happened?" She crawled up onto Roy's bed and lightly gripped Roy's arm, "Ah...you're still sick, huh...?" Minoushje walked into the room, a frown etched into her forehead. "Hidan's gone..." She said as she sat down on the edge of the bed. "If we have to believe Hidan's words this isn't going to be the last time they will try to kill you. I don't have names but several of the Akatsuki want to see all of us disappear... apparently the HMA, or the Hidden Site, is seen as a threat in the eyes of the Akatsuki." Roy smiled over at Nikki, holding up a hand. "Hiya. All's good." She said, scratching the back of her head before looking to Mino. A small laugh came from Roy, even though it was a serious matter. "I already know who it is...it's not that hard to figure. Hidan obviously...and I know Kakuzu is in on it...he said something that gave him away last time we were drinking..." She said, sighing. "And...I'm pretty sure Pein isn't in on it just yet...but..." She stopped, not wanting to say Madara's name. Her eyes narrowed, "I'm going to go talk with Pein later..." She said, though her intention was to talk with the true leader. "Where's Sasori-Sama...?" She questioned, narrowing her eyes as she was waiting for Paige and Zen to return with Sasuke. Nikki stayed attached to Roy's arm, "Last time you told me that...and then you were in a coma for a week." She lightly huffed, "Geez...I'm too much of a push-over sometimes..."
Roy scratched the back of her head, "Eheheh....my bad?" She said, sweat dropping. "Anywho..." She looked back to Mino. "What happened down there...? And why didn't Sasori-Sama come back with you..?" She looked out the door and frowned a bit. "Did...Hidan say something to him...?"